Directions From New Martinsville, WV, go out Doolin past Bebee to New Dale which is 10.2 miles. Turn right on CR 89 and go 1.5 miles. Turn right and go .2 miles and turn left on Harland Ridge. Go about one mile and take a sharp left onto a lane. 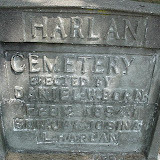 About .2 miles out the lane and on top of a knoll is the Harlan Cemetery. This cemetery was read 12 Sep 1998 by Thomas Fankhouser. Additional information provided by Karen Hucko. Photos provided by Donnie Huggins. There are 8 more unreadable or broken tombstones in this cemetery. Williams, Eleanor 11 Sep 1918 3 FEb 1920 d/o S.W. & B.M. Williams, Mildred L. 20 Jun 1925 21 Jul 1925 d/o N.J. & N.B. Wright, Corriann 24 Feb 1888 6 Jan 1902 d/o G.W. & L.R.